In her new book, Buy, Close, Move In!, award-winning real estate guru tells readers everything they need to rebuild their financial lives to wade back into the housing market. In this excerpt, she points out the biggest mistakes that prospective buyers are making. With real estate rules, laws, and fees changing daily, it’s easy to make a mistake when shopping for a home or a loan. Here are some of the most common mistakes buyers are making in the new housing market — and some tips on how you can avoid following suit. What’s changed in real estate? The details. While you still go out and shop for a home, make an offer, find financing and close on the property, the details of how this process works today are vastly different from the way we went about buying real estate five, 10, or 20 years ago. If you attempt to wade in without familiarizing yourself with the new way of doing business, you’ll find yourself blocked at almost every turn. Finding good partners (see below) can help, but you have to be prepared to provide more information and evaluate more factors in order to close successfully on a new home. If you buy and sell property for a living, you know that it’s a team sport. Even if you’re a real estate agent, you’ll still need a good lender, inspector, title or escrow company, and attorney to assist you in completing this purchase successfully. But some buyers think they can do it on their own. In today’s new real estate world, that’s a mistake. For example, even in states where real estate attorneys aren’t generally used to close house deals, using an attorney to help you negotiate a foreclosure or short-sale purchase can mean the difference between closing and sitting in limbo. Real estate agents who intimately know the foreclosure market or have colleagues who represent real estate owned properties for banks and other financial institutions can help you find the right property faster. Get on their short list as an investor with cash to spend and they’ll give you extra time and attention. Taking the time to build a great real estate team will pay off in spades. Not putting this team together ahead of time is a mistake you don’t want to make. Lenders have tightened up credit requirements and are taking the time to verify every piece of information you submit. In fact, when you apply for a mortgage today, you should expect to provide reams of documentation both with your application and during the verification process. It’s quite likely that some of your information will disappear during the process, and you’ll be asked to replace various documents or augment your documentation. When these requests come in, you should take them seriously and respond quickly. If you don’t, you could be putting your financing in jeopardy. One of the ways lenders are tightening credit requirements is by raising the minimum credit score necessary to be approved for a mortgage. Prior to the credit crisis, lenders might have charged one interest rate if you had a 680 credit score — today you might need a credit score of 720 to get the same rate. When it comes to government-backed loans, FHA originally didn’t have a minimum acceptable credit score limit, but it has now instituted tougher standards that require a credit score floor of at least 600 in order to get a loan. That’s why is extremely important that you spend time cleaning up your credit history and score before you apply for a loan. While it’s true that in some markets, “bottom feeders” are coming in and swooping up properties by the dozen, fear is the wrong emotion to drive the real estate market. The housing bubble formed because too many folks were thinking about real estate as an investment and not about the other parts of the equation. They were afraid to wait, believing that property prices would go up at 8 to 10 percent per year. We now know that property prices can tank as well as soar. The trick is to understand what the real value is in a neighborhood and not overpay for property. Don’t be pressured into making a move before you’re ready. Scam artists love the Internet, and there will always someone trying to scam you in some way, shape, or form. And when it comes to real estate, it’s even easier to get ensnared in someone’s web. But even if you don’t get scammed, it’s easy to get fooled by what you read or see on the Internet. If you shop for a home only on the Internet, and never go to see the property in person, you might be surprised to find that the house looks different, or the neighborhood is not as it was represented. Perhaps the property backs up to a dump or the train tracks that you didn’t notice when you did your Google search. The smartest thing you can do is take everything you see on the Internet with a grain of salt — and then take the time to see the property in person. The housing crisis has produced millions of foreclosures. But it has also spawned millions of homeowners who are “underwater” with their mortgages — that is, who owe more than their homes are worth — and are offering them for sale for less than the mortgage amount. There are some risks involved when you buy a home through one of these so-called “short sales”: The property might have years of deferred maintenance (because if you can’t afford your mortgage, you probably can’t afford to maintain your home either); there may be hidden liens lurking that will cause problems after the closing; and you may have to negotiate with several lenders, which could take months. If you’re hoping for a big bargain from an underwater seller, you’ll need to be patient. And above all, you’ll need to realize that even if you’ve spent months negotiating a deal, it could fall apart overnight — and you’ll have to start all over again. Don’t risk it. Order an owner’s title insurance policy when you order the lender’s policy. If you’re buying with cash, don’t forget to order your owner’s policy well in advance of the closing date. At a “How to Profit from Foreclosures” event I held in Atlanta in October 2009, I learned that there were more than 4,000 HUD homes for sale. (A HUD home is simply a foreclosure that had FHA financing.) I learned that there are clever ways of searching for an agent who is more than just HUD-certified, but who really knows how to put in an offer on a HUD home. (You must have a HUD-certified agent put in your offers for HUD homes.) I learned that home buyers who plan to live in the house have a two-week advantage over real estate investors. And I learned that with FHA financing about 20 to 25 percent of all homes purchased, there will be plenty of HUD homes for sale over the next few years. There are thousands of HUD homes for sale across the country, in most neighborhoods. If you’re not thinking about buying HUD homes, you should. Excerpt from Buy, Close, Move In! reprinted courtesy of Harper Paperbacks. 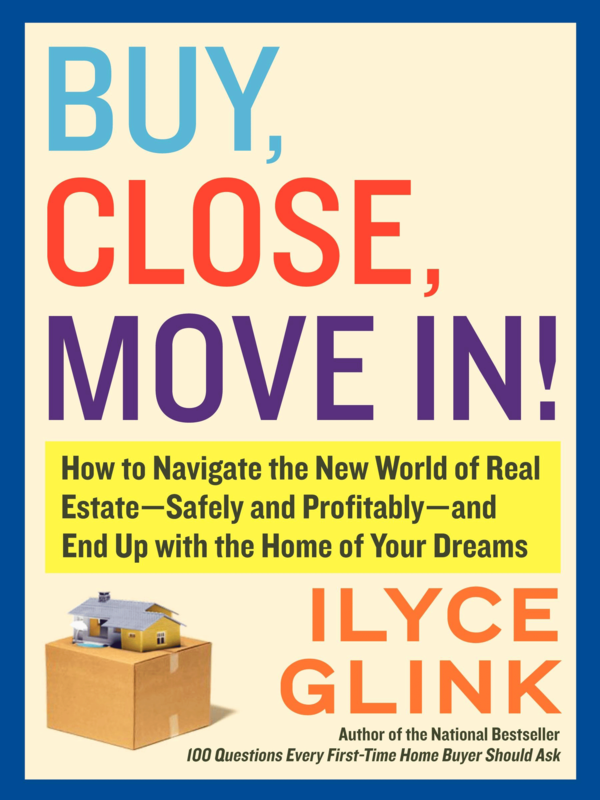 Ilyce R. Glink is an award-winning, nationally syndicated columnist, best-selling book author, and radio talk show host who also hosts "Expert Real Estate Tips," a Internet video show. She owns and operates several websites including ThinkGlink.com, ExpertRealEstateTips.net, LawProblems.com, and HouseTask.com, as well as Think Glink Publishing LLC, a privately held company that provides consulting services as well as editorial content and video for companies and non-profit organizations. An in-demand speaker, she appears frequently on CNN, CNBC, NPR, and in local media outlets across the country.